FIU President Mark B. Rosenberg talks with Danny Danon, an FIU alumnus and the permanent representative of Israel to the United Nations. Danny Danon, permanent Israeli representative to the United Nations, looked around Rafael Diaz-Balart Hall and said it was good to be back at Florida International University. “This time, I have no exams and no papers to submit,’’ joked Danon ’96, who earned his degree in international relations at FIU before returning to Jerusalem, where he earned a master’s in public policy at Hebrew University. Danon acknowledged his former professor, faculty emeritus Charles MacDonald of the Department of Politics and International Relations, and said his experience at FIU helped prepare him for a career in international politics. 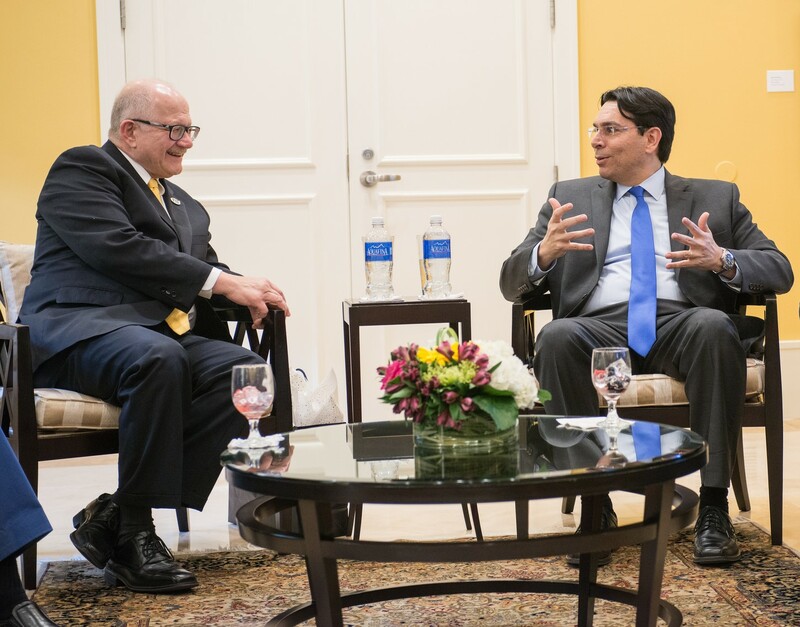 “What I learned at FIU gave me the understanding I needed to promote the ideas and values of the only democracy in the Middle East,’’ said Danon, who was on campus as part of the Ruth K. and Shepard Broad Distinguished Lecture Series of the Steven J. Green School of International and Public Affairs. Danon has served as an ambassador to the U.N. since October 2015. Before that, he was deputy minister of defense and a member of the Knesset, the Israeli Parliament, among other positions in the Israeli government. Danon said he blamed the “culture of hatred” against Israel for the failure of peace efforts in the Middle East. He said he remains “optimistic” about establishing relations with other countries in the region and called on the U.N. to take action against the violence. Danon urged students in the audience to “stand up” and “be active” about issues that matter to them. In introducing Danon, Dean John Stack provided some context for the discussion. Following his lecture, Danon was hosted, along with members of the Israeli Consulate, at the Reagan House by President Mark B. Rosenberg. if they did, we’d see that israel is the root of all terrorism.